It is better to travel well than to arrive, it has been said. Referee Rasta Rasivhenge of South Africa will dispute that when he rushed from Durban to San Francisco, from a Super Rugby decider to Sevens World Cup, with all that sitting and having your circadian rhythms mangled. It is an interesting story, which may come as a surprise who believe that referees always trot out onto a field, cool, calm and healthy. But let Rasta speak. 2018 was always going to be a testing year for all Sevens teams around the world. From the qualifiers to the World Series, to the Commonwealth Games, to the regional qualifiers and to the World Cup. For all those that were going to be involved it was always going to be a major year and many accolades should go to all the players involved in all the Sevens tournaments, to the backroom staff of all various tournaments and the volunteers that contributed to what I can say was a colossal year for the greatest game of rugby called Sevens. Appointments for the Sevens World Cup had been made a couple of months ago and I was busy with Super Rugby at the time knowing that I had the 2019 Rugby World Cup in-sight that I had to prepare for. I refereed a couple of top Super Rugby games in the lead-up of the Sevens World Cup. I was nervous as I had not refereed enough Sevens in order to be game ready for the Sevens World Cup. I even refereed a crucial crunch game of Super Rugby the day before I flew out to San Francisco where the Sharks played the Jaguares in what was a decider for the Sharks and a home or away quarterfinal for the Jaguares. I knew I would have to front up after the game and change my thought processes in order to be ready for the World Cup in San Francisco. I jumped on the plane back to Cape Town on Sunday so that I could be in time for a connecting flight to fly to San Francisco via Dubai. I knew it was going to be a tough trip as I had a "9 hours 45 minutes" flight to Dubai then a "15 hours 30 minutes" flight to San Francisco. I sat on the first flight watching past videos of games I had refereed in order to come up with a strategy on how I would referee at the World Cup. I focused only on games where I had a couple of challenges and wanted to avoid these in the games I was going to referee. I knew the format of the World Cup had changed and each game was a death game, as the winner would advance to the next stage and the loser would be relegated to the bowl competition. I like pressure and every game was a final in my eyes as the format brought in great excitement and teams had to be up for every game. I arrived a day later than the rest of the referee team feeling a bit jet lagged but that was great motivation for me to go out and give every game my best shot as I had to come up with strategies to overcome the jet lag. I landed on the Monday night and I had three and half days to recover and get started in a great competition. I didn’t know what to expect but there was a great buzz for the World Cup and the American public including the travelers from around the world brought their 'A' game and supported the competition well. I did some sightseeing for the three days I had, with some training and technical/coaching sessions and I was itching to get out onto the field and referee in the competition. I was lucky to get one game on Day 1 - the Friday. I refereed the last game where the hosts played Wales. The last game of the day was always going to be spicy as the hosts had to play Wales who already had a game under their belt and USA were playing their first game based on seeding’s from the World Series and the loser was going into the bowl competition. So the pressure was always going to be there as the winner qualified for the cup quarterfinals. I went into the game with confidence and embraced the challenge as I have been in these moments before and credit goes to David Galbraith, a New Zealander and a sports psychologist, who has taught me that I need to know how to deal with ups and downs, highs and lows - in my view, the best thing I have ever learned from a psychologist in terms of facing high-pressure moments. The game went well and USA turned out victors by 30 odd points. The last game ended late on Friday, so it was a short turn around and an early start on Saturday. I was excited for Day 2 after we witnessed scintillating rugby on Day 1 of the World Cup. It was a packed stadium and I was so excited for more action. I had some tasty matches on Day 2 as I refereed Chile vs Uganda which turned out to be a try-fest and entertaining for the public. I later had to referee a massive quarterfinal where the USA played England and it was a tight game that ended up in a draw and we had to go to extra time where England scored the match-winning try with a cross kick that was gathered by Phil Burgess. 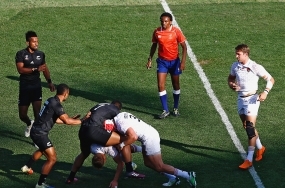 This was probably the try of the tournament. The curtain was coming down on the tournament and it was at the business end. I was selected to referee the semifinal where Fiji were playing New Zealand. I had been in this moment before in the Olympics and it’s an intense game as they are major rivals. New Zealand won the game and it was the last set of matches left of the tournament. We had a meeting in our change room as is the norm before they announce referees for the last eight games of the tournament. The officials were announced, and I was given the opportunity to referee the final where New Zealand played England. This was a repeat of 2013 World Cup Sevens final in Moscow. I had refereed that final and I was ecstatic to be given the opportunity to close the tournament for the second time in my career. I was fortunate to referee the final in 2013, the Olympic final in 2016 and this year’s World Cup final. New Zealand beat England 33-12 and the curtain came down on what I would say one of the best tournaments I have been part of as I loved everything about San Francisco. Thanks to World Rugby's Paddy O'Brien, Craig Joubert, SA Rugby and all the officials involved as this was a special tournament for many reasons.